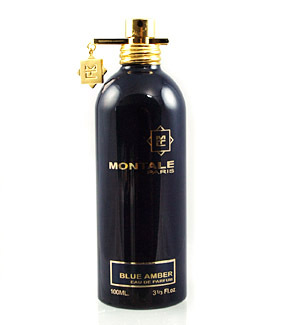 I’ve always thought of Montale Blue Amber as a cyborg amber. It is warm and personable like most ambers, but Blue Amber is different. Blue Amber is also cool, almost robotic in its unusual opening. It’s both biological and artificial, like a sci-fi cyborg. And I like it because of this. Blue Amber does open up with that “classic” oriental bergamot and citrus that I sniff in classic orientals. This bergamot fades quickly. Something in this is stranger than a classic oriental, just weirdness on all this amber. I’m sure this is the coriander. It’s green, spicy, and fresh (strangely chemical) but mixed with this strong “liquid” amber. This strange goes away or I get used to the idea of a fresh, green in my amber perfume that vaguely reminds me of toxic chemicals that I have used to strip adhesive off of flat surfaces. I also pick up something that reminds me of tanned leather mixed with a slightly sweaty amber. All of this together is very nice but doesn’t seem very approachable to me. This is the “machine” in Blue Amber. It’s trying very hard and there is a strange “accord” that reminds me of something familiar. A chemical used during our DIY home restoration. With time, I’m left with tons and tons of amber, but it isn’t round and smooth. It’s almost like a metallic amber. Must be the addition of vetiver? What I’m trying to say is that Blue Amber isn’t powdery. It’s smooth and glimmers like polished metal. It’s very beautiful and a must try for those that don’t want their amber going all powdery on them. Blue Amber is ambery, liquid amber, like amber mercury. But, then it gets very sweet with a strong dose of high quality raw vanilla mixed with this liquid amber. I’m left with this cozy, comfortable, and creamy concoction. This is the human aspect to Blue Amber. This cyborg has a warm fuzzy feeling, put away the weapons, and decided to make cupcakes for the whole gang. There are so many wonderful amber perfumes available, so what makes Blue Amber special? Well, like all Montales, Blue Amber is brash and audacious. There’s major sillage to this one and it is incredibly long lasting. This is one of those perfumes that sticks with you until you bathe. Who knows how long it would actually last on the skin! The other interesting thing about Blue Amber is that one could argue that this is the most natural amber fragrance they have ever sniffed or that it is the most synthetic amber that they have ever sniffed. How can something be interpreted so differently? Because it is cyborg amber 🙂 In all honesty, the first few times I wore Blue Amber, I didn’t like it because I thought it was boring. I could only focus on the strange notes and I found the linear amber theme dull. The more I wear it, the more I like it. But, I have to be in the mood for a linear amber or an amber-vanilla. And I’m usually in the mood for those in the winter. Notes listed include Italian bergamot, bourbon geranium, coriander, patchouli, vetiver, amber, and vanilla. Give Blue Amber a try if you want a really loud and long-wearing amber-vanilla perfume or if you want an amber that isn’t powdery. Blue Amber is easily unisex. The 3.4 oz bottle retails for $170 on Amazon. *Sample purchased by me. Product pic from Luckyscent. Post contains an affiliate link. Thanks! maybe the fact that it comes out of a metal can influences me, but it definitely smells metallic to me as well, and not at all powdery. but recognizably amber nonetheless. I wonder if I was being influenced by the policeman blue metal can when I think of sci-fi “cyborg”. I think I am, slightly, but I do believe Blue Amber is a metallic amber, like a mercury amber. No powder but undeniably amber. I think of amber as being warm, soft, but Blue Amber has a Robo-Cop metallic exoskeleton. And yes, it wears and wears. I dabbed, can’t imagine it sprayed on. More oud when sprayed on? I can see that. The more I put on the “schweatier” it became. I have had no luck with Montales so far. They are all metallic to me!